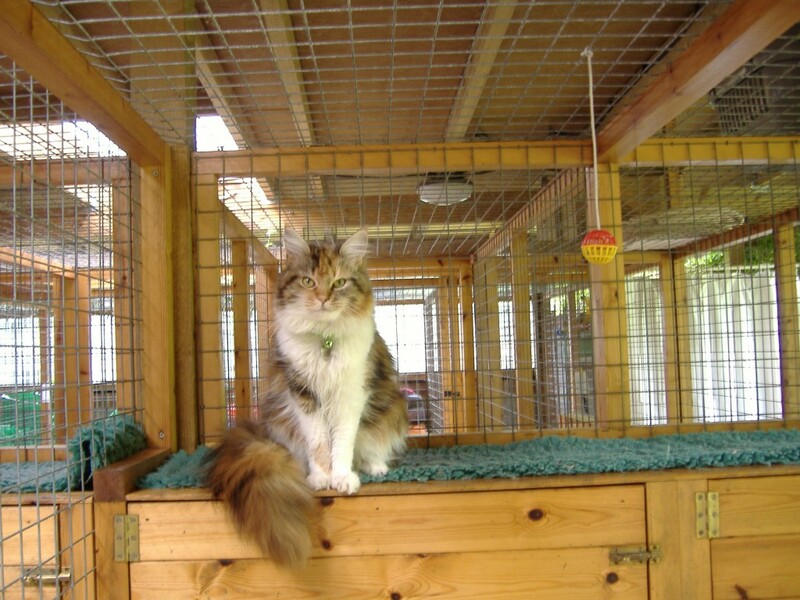 Our lovely cattery which is located away from the kennels and built on the side of our home is the height of luxury with a roof cover with sky lights to let the sun in. During the day it is without doubt cat heaven! Each cat has an individual heater for the winter months which is located inside a purpose made house with warm vet bedding and a comfy place to sit on top. We provide each pen with a cat scratching post and an assortment of toys, the cattery has a tiled floor and is cleaned daily and the cats are given fresh water and food. Each cat is monitored and recorded on a chart during its stay with us to ensure they are eating and using the litter trays provided. Cats must be fully inoculated against Feline leukaemia, Feline infectious enteritis, Feline viral rhinotracheitis (Feline Herpes Virus) and Feline calicivirus, and must have had a booster injection with the previous twelve months. We generally provide Arden Grange and hold some wet food. Please check when booking your cat in with us to see whether we stock your cats favourite brand. Everything your Cat requires for his/her stay at Haytor is provided. We have a plentiful supply of bedding and toys. However if you wish to bring your cats own toys we will be pleased to let them have them during their stay.